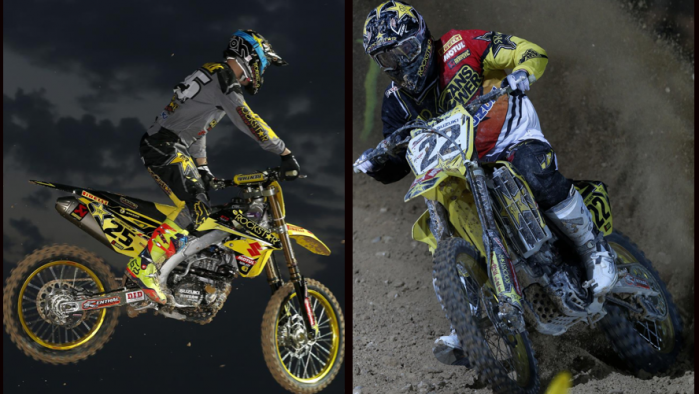 Rockstar Energy Suzuki World MXGP’s Clement Desalle and Kevin Strijbos tentatively launched their seasons on the factory RM-Z450s with seventh and eighth positions in the opening rounds of the FIM MXGP Championship under the floodlights of Losail in Qatar on Saturday evening. Rutty and bumpy in places and with plenty of air-time for the bikes Losail was formed from an inconsistent desert terrain in terms of traction and grip and demanding bumps. It meant the riders had to stay sharp and focussed through the two 30 minute and two-lap motos; the shorter race time for 2014 placing extra emphasis on the starts and the opening laps. Desalle, who conquered the inaugural edition of the Qatari event exactly 12 months previously, came to the Grand Prix with minimal riding time in the winter due to recovery from a shoulder operation. The Belgian struggled with his starts and was particularly frustrated after the first moto as several early mistakes, including one slip-off the Suzuki, meant he could rise no higher than ninth. He wasn’t able to getaway with the leaders at the drop of the second moto but pushed through several positions to reach the chequered flag in sixth. Strijbos celebrated a firm and indisputable run to the first pole position of the season on Friday and looked as though he might repeat the performance in the opening sprint. The Belgian took the holeshot and led the field for the first two of 18 laps. Unfortunately he suffered some arm-pump and did not have the strength to push and #22 dropped back to seventh. In Moto2 he could not replicate his sizzling getaway from the gate but motored through the distance to capture eighth spot; two places behind his team-mate. The Belgian crew only had a brief time to take stock as the bikes, spares and equipment were quickly crated and sealed for transport to Thailand. The squad will make their way from western Asia and across to the capital of Bangkok, then down to the nearby city of Pattaya where the Si Racha circuit will host the second Thai Grand Prix this coming weekend. MXGP Moto1: 1. Maximilian Nagl (GER, Honda), 34:57.925; 2. Antonio Cairoli (ITA, KTM), +0:01.942; 3. Gautier Paulin (FRA, Kawasaki), +0:07.827; 4. Steven Frossard (FRA, Kawasaki), +0:15.643; 5. Jeremy Van Horebeek (BEL, Yamaha), +0:26.612; 6. Tommy Searle (GBR, Kawasaki), +0:31.196; 7. Kevin Strijbos (BEL, Rockstar Energy Suzuki), +0:33.585; 8. Evgeny Bobryshev (RUS, Honda), +0:34.386; 9. Clement Desalle (BEL, Rockstar Energy Suzuki), +0:34.597; 10. Joel Roelants (BEL, Honda), +0:50.077. MXGP Moto2: 1. Gautier Paulin (FRA, Kawasaki), 35:04.471; 2. Steven Frossard (FRA, Kawasaki), +0:02.773; 3. Antonio Cairoli (ITA, KTM), +0:09.941; 4. Maximilian Nagl (GER, Honda), +0:13.124; 5. Jeremy Van Horebeek (BEL, Yamaha), +0:20.093; 6. Clement Desalle (BEL, Rockstar Energy Suzuki), +0:23.932; 7. Tommy Searle (GBR, Kawasaki), +0:25.651; 8. Kevin Strijbos (BEL, Rockstar Energy Suzuki), +0:38.386; 9. Evgeny Bobryshev (RUS, Honda), +1:02.213; 10. Joel Roelants (BEL, Honda) +1:05.317. MXGP Overall result: 1. Gautier Paulin (FRA, KAW), 45 points; 2. Maximilian Nagl (GER, HON), 43 p.; 3. Antonio Cairoli (ITA, KTM), 42 p.; 4. Steven Frossard (FRA, KAW), 40 p.; 5. Jeremy Van Horebeek (BEL, YAM), 32 p.; 6. Tommy Searle (GBR, KAW), 29 p.; 7. Clement Desalle (BEL, Rockstar Energy Suzuki), 27 p.; 8. Kevin Strijbos (BEL, Rockstar Energy Suzuki), 27 p.; 9. Evgeny Bobryshev (RUS, HON), 25 p.; 10. Joel Roelants (BEL, HON), 22 p.
MXGP World Championship Standings (after 1 of 18 rounds): 1. Gautier Paulin (FRA, KAW), 45 points; 2. Maximilian Nagl (GER, HON), 43 p.; 3. Antonio Cairoli (ITA, KTM), 42 p.; 4. Steven Frossard (FRA, KAW), 40 p.; 5. Jeremy Van Horebeek (BEL, YAM), 32 p.; 6. Tommy Searle (GBR, KAW), 29 p.; 7. Clement Desalle (BEL, Rockstar Energy Suzuki), 27 p.; 8. Kevin Strijbos (BEL, Rockstar Energy Suzuki), 27 p.; 9. Evgeny Bobryshev (RUS, HON), 25 p.; 10. Joel Roelants (BEL, HON), 22 p.